Sir Ralph Pendlebury Orphanage was established in 1882 as a result of a legacy of £100,000 by the former Mayor of Stockport and mill owner. Pendlebury died on 9th November 1861 and it took more than twenty years for his legatees to settle on the Orphanage scheme, although prior to that, a charity set up to administer the funds had dispensed money to other good causes. The new building was erected on a plot of land on Lancashire Hill, Heaton Norris, opposite Hanover Independent Chapel. Five architects submitted plans for the establishment, with the selected design being by Mr J.W. Beaumont of Manchester and Wilmslow. Its construction cost in the region of £10,000, exclusive of furnishing. The Orphanage was formally opened on April 13th, 1882, the ceremony being performed by Lord Vernon. The building had three linked sections One portion occupied by the main house, the second by administrative offices for outdoor relief, and the third by the principal entrance and an assembly hall. The house included a day room, 30 feet by 20 feet, with separate entrances and cloak rooms for boys and girls, a large kitchen, offices, and two parlours for the master and mistress. On the first floor were two large dormitories and four smaller bedrooms, bathroom, linen closet, etc. The outdoor relief department comprised a boardroom, ladies' committee-room, secretary's office, cloakrooms, and applicants' waiting-room with separate entrance. The buildings were faced with Ruabon red stock bricks, with stone jambs and mullions to the windows and doors and moulded strings of stone and terracotta. A tower at the centre of the building rose to a height of 98 feet from which distant views could be obtained. The building contractors were Messrs. Southern and Sons of Stockport. The Orphanage site is shown on the 1910 map below. 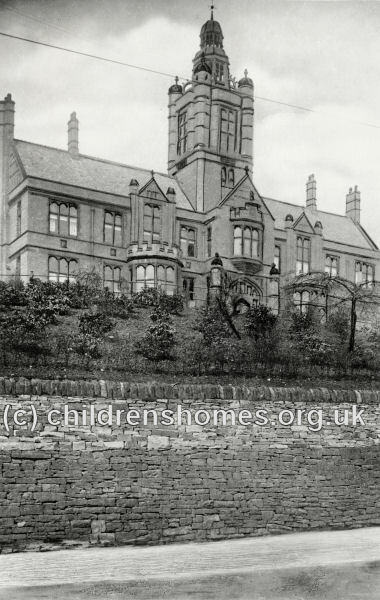 Sir Ralph Pendlebury Orphanage site, Stockport, c.1910. During the First World War, the premises were loaned to the Stockport Division of the Red Cross Society for use as a military hospital. By the 1950s, the site was occupied by the Stockport Secondary Technical School for Boys. It later became Pendlebury Hall residential care home, now known as Hilltop Hall. Sir Ralph Pendlebury's Charity for Orphans is still in operation and provides grants to the parents or guardians of orphaned children in the Stockport area who are judged worthy of financial support. Stockport Archives, Central Library, Wellington Road South, Stockport SK1 3RS. Holdings: Records for Sir Ralph Pendlebury's Charity for Orphans (1870-1980); Ground plan of the orphanage.